"Sampath Speaking" - the thoughts of an Insurer from Thiruvallikkeni: Finland baby boxes ... akin to .. Amma baby care kit !! Finland baby boxes ... akin to .. Amma baby care kit !! It is not State specific ~ Each State has followed and tried to outsmart other – political parties thrive in culture of providing freebies, making its citizens happy .. .. .. are they useful ? – unrelated : in my childhood there was Binaca toothpaste – everymonth as we opened the paste, there would be a small toy (animal bommai) (bears, rabbit, mouse, elephant, lion, dog and more .. .. .. .. ) these rubber toys made us so happy ! – still have a few of them ..
Finland is a country in Northern Europe. Finland is a Nordic country and is situated in the geographical region of Fennoscandia. The capital and largest city is Helsinki. Other major cities are Espoo and Tampere. Finland is the eighth-largest country in Europe and the most sparsely populated country in the European Union. Finland was inhabited when the last ice age ended, approximately 9000 BCE. The first settlers left behind artefacts that present characteristics shared with those found in Estonia, Russia, and Norway. The city is bracing for the 2nd death anniversary of its leader Ms J Jayalalithaa. CM Mr Edappadi K Palaniswami has conquered to lead successfully till date and perhaps is getting strong. 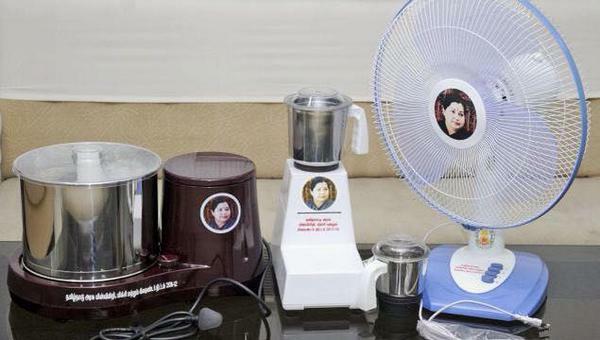 Ms Jaya’s tenure was marked by freebies that included – bicycles, meals, sewing machines, computers to students, then Amma water, amma salt, Amma pharmacy and .. .. most successful Amma canteens. The low priced canteens are real boon for poor, in Govt hospitals and the like – though one can have different opinion of it in other places .. .. a visit to any Govt hospital would sure make people realise the woes of the poor. For those admitted and more for those attending to those undergoing treatment, these low-priced serving quality food have been a real benefit. This is more about another free-scheme launched in 2014. Tamil Nadu Chief Minister Jayalalithaa announced the launch of the 'Amma Baby Care Kit' for newborns in government hospitals. The Rs 1000 kit had 16 items that included towels, a dress, sanitiser, milk booster, doll, rattle, nail clipper among other things. 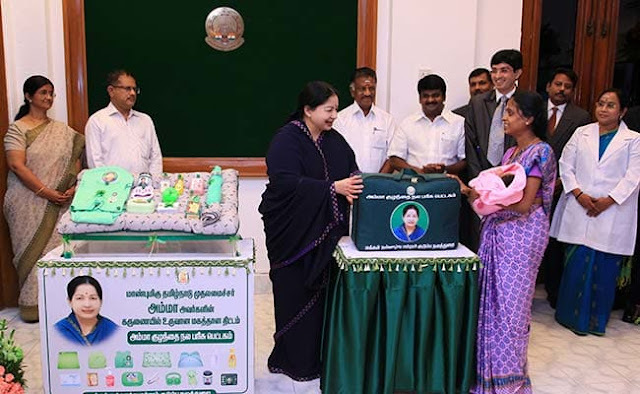 The government would spend over Rs 67 crore which would benefit over 6.7 lakh babies this year alone, Chief Minister Jayalalithaa said, making a suo motu statement in the Assembly. It was an announcement coming close on the heels of government launching 'Amma' seeds to provide farmers and general public with quality seeds at reasonable price and other schemes. .. .. with this background, read this report in today’s BBC. “It’s a bunny,” exclaims Adnan Racaj with delight. “No, it’s an elephant,” corrects his partner, Heidi Lempiö, as she unpacks a sizeable box they’ve just collected from their local supermarket. The colourful cardboard box is crammed with items for their first baby, due in February. This year, there are 63 items in the box.“Kela wishes you happiness and congratulates the whole family,” says Lempiö, 38, reading from a card inside the box. She is a lawyer and her husband Racaj, 36, is a technician. They live in Espoo, not far from the Finnish capital Helsinki. The box is not a present from a generous aunt or a friend. Kela is the government’s social security agency. Expectant parents across Finland all receive the same box from the state.But who pays for it and what does the gift aim to achieve? And has the baby box programme brought economic benefits for the whole country? When the baby box was first introduced in 1938, its value was around 450 Finnish markka (about £2, $2.6), about a third of an industrial worker’s monthly wage. Its aim was to improve maternal and infant health, and to combat low population growth between the two world wars. In 1936, Kela statistics show, 4,543 children died before turning one, equal to 66 deaths in every 1,000 births. Influenza, pneumonia, diarrhoea, whooping cough and tuberculosis were the most common causes of infant mortality. Back then 80% of the population lived in villages in what was a mostly poor, agrarian nation. Health services were limited and mothers mostly gave birth at home, not always in hygienic conditions, so the first baby boxes included a clean sheet of paper on which to give birth.Ordinary people also had a “very low level of knowledge” about pregnancy-related health issues, says Reija Klemetti, research manager and an expert on sexual and reproductive health from the National Institute for Health and Welfare in Helsinki. In the 1940s and 50s the box included sheets and pieces of cloth, everything was plain in colour so mothers would make and embroider the clothes to personalise them. Another rationale for the box was the pressing need for Finland to produce more babies. Early in the 20th Century, after the deaths in World War One, population decline was a significant worry for European politicians.“Healthy babies would grow up to be healthy tax-payers,” says Finnish ethnologist Sanna Särkelä. “They also wanted potential soldiers for the possible new world war.” In the 1930s, the government feared a new generation of Finns would be needed to staff an army against duel threats from Hitler’s Germany and Stalin’s Soviet Union. The first baby boxes came with strings attached: the mother had to visit a doctor, a midwife or pre-natal health clinic for a medical check-up. It incentivised women to seek pre-natal healthcare, a practise that continues today. According to Karoliina Koskenvuo, head of the research team at Kela, the direct link between medical care and the baby box has saved lives by detecting problems early in both mothers and babies. In 2017, Finland had 3.9 infant deaths per 1,000 live and stillbirths, a more than 10-fold reduction on the 1930s. Maternal mortality has also fallen significantly, from 71.8 per 100,000 live births in 1960 to 5.7 in 2016.Of course, it wasn’t just the baby box – medical facilities and immunisation programmes also developed rapidly during this period, and more women gave birth in hospital. Living standards rose and knowledge about nutrition and health increased, all contributing to reduced deaths. From 1949 the baby box was being distributed to all prospective parents in Finland. It has since become a shared experience connecting generations and even part of Finland’s national identity. Even President Sauli Niinistö received a box this year, after the birth of his son in February. “How could he refuse the box?” asks sociologist Anna Rotkirch, who heads the Population Research Institute at the Finnish Family Federation. “It’s very Finnish. It helps create cohesion and trust in society by giving all children a similar start in life.”It is a kind of symbol of Finnish equal society. Everybody gets the box, whether you are rich or poor - Särkkä. Generations of Finns have grown up playing together in exactly the same outfits from their baby boxes. Some feel it reflects Finns’ egalitarian approach and a sense of shared social responsibility.Outfits in the box change every year, so it’s easy for mothers to spot babies born around the same time. The government’s decision to provide all parents with a baby box makes the statement that it values the life of every child, says Rotkirch. Yet the architects behind such a significant national programme are not widely known. Perhaps this is a reflection of Finnish society: the box became part of a relationship between the state and its new generation, rather than being used by any single politician as a popularity-enhancing tool. Early baby boxes included a guidebook for mothers. The contents of the box have changed along with Finnish society. All clothes are gender neutral, so boys and girls get the same. It sends the message that girls are equal to boys. Finland has become one of the most advanced economies in Europe partly by proactively getting more women back into the workforce.Since 2011, baby boxes have not contained any brochures or books, but the items are still designed to send parents certain signals. “Every item in it is there for a reason, giving a message,” says Särkelä.The box contained a dummy from 1995-2000, for example, and a baby bottle from 1998-2000. But when it was established that breastfeeding was best, bottles and dummies promptly disappeared from the box. A committee meets each year to decide what to include. This year, it added items including felt booties in the Finnish flag’s blue and white, woollen trousers, leggings and a spoon. 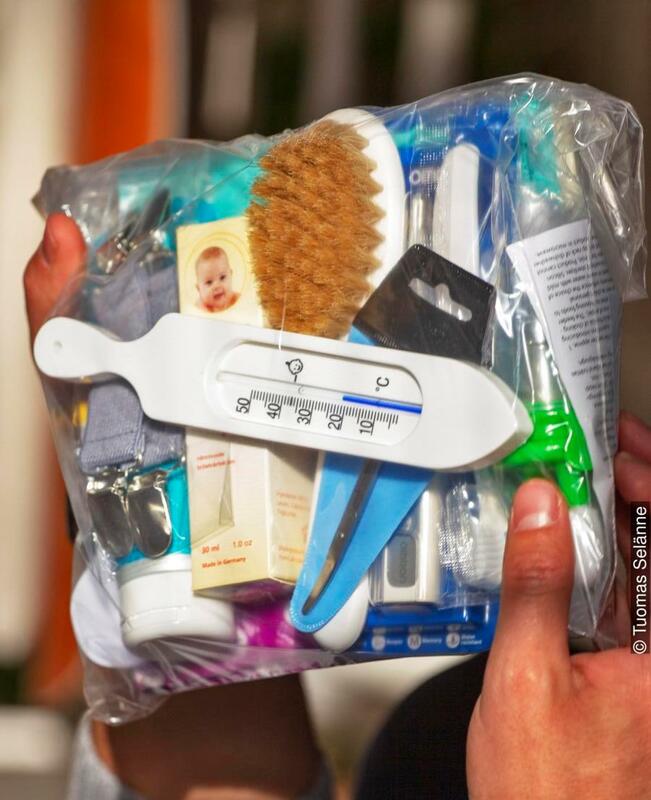 There are 63 items in the 2018 baby box including a baby toothbrush and 'huopattosut' felt baby booties in the colours of the Finnish flag. Interesting ! ~ and attractive even to a land used to getting freebies of all hues ! ~ but then why did experts and some commoners criticise Ms Jayalalithaa ! !